Since Apple agreed to buy back my iPhone 7 Plus at the full Softbank contract list price of 129,000 yen I decided to take them up on it. 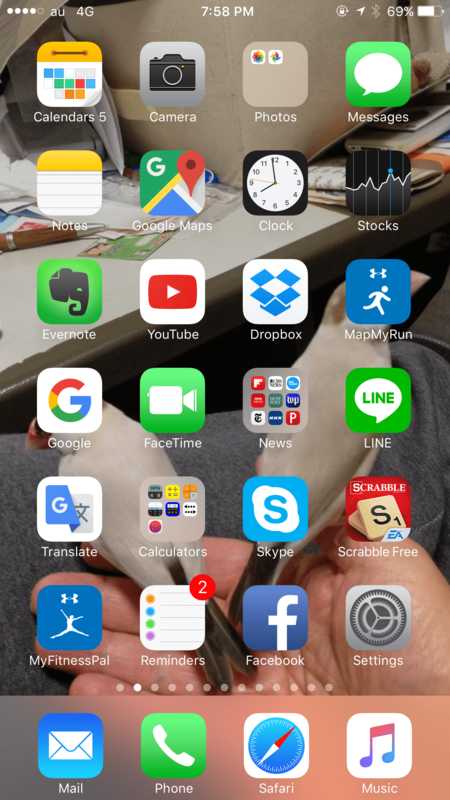 So, not only am I making 9,000 yen on the deal, I’m getting a new phone and two more years of AppleCare coverage. Plus since I’m getting it directly from Apple, the new iPhone will be unlocked to start with and I can use it on my scheduled U.S. trip for my mother’s birthday in April. Will it be “as bright” as the iPhone 6 Plus. Probably not. But at this point this deal seems like a no-brainer to do for now. And who knows, maybe it will be brighter. Also getting it directly from Apple means there is a 14 day return policy if I change my mind. And I’m sticking with Apple, which I feel relieved and comfortable about for now. * I don’t know why the Softbank list price (pre carrier discount for a two year contract) comes to 129,000 yen including tax and AppleCare, instead of the 120,000 yen you would pay when buying direct from Apple. That remains a mystery, but Apple is agreeable with paying the 129,000 list price on my Softbank contract. Probably to shut up a crackpot customer. I received a call from the Apple liaison this evening and the final conclusion is that as far as Apple is concerned that’s just the way they are. 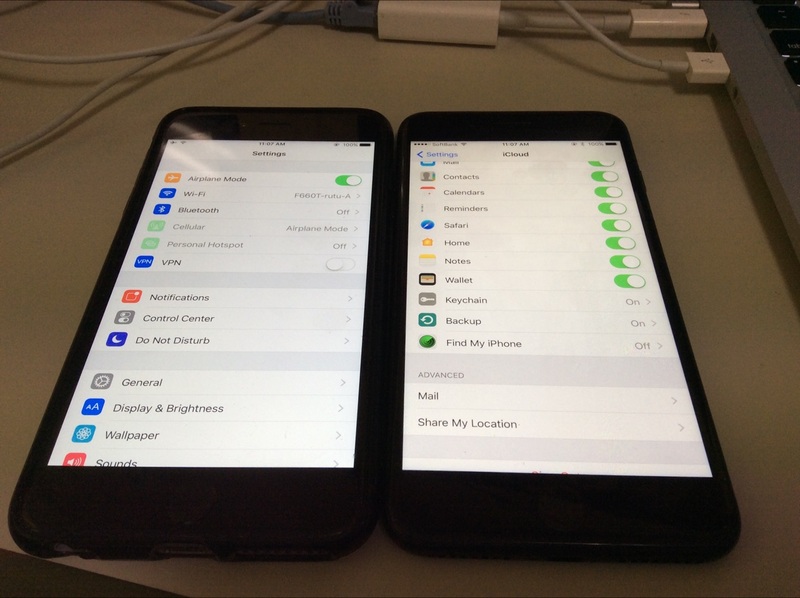 They admit there is a variation in the phones during manufacture, but they aren’t willing to continue to exchange phones until we find one that is as bright and noticeably more vibrant and brilliant as advertised – or even as bright as the iPhone 7 Plus my friend from the U.S. has, which we compared side-by-side during his visit here to Japan. However, Apple are willing to let me think about it for a week or so and even though I bought it from my carrier, Softbank, and even though Softbank does not allow returns and refunds, Apple would be willing to let me sell the phone to Apple for the full retail price and I could then just buy another cell phone with the carrier. In other words, they are offering me a way out, if I decide I want to do that. So I will think about it. I’m of course disappointed with Apple and with the quality of the screen. And the logic of the engineering team bewilders me. They are advertising one thing and selling another. It’s clear to anybody who looks at my side-by-side photos, which compare the iPhone 7 Plus and my iPhone 6 Plus displays. It’s even more obvious in person. The Apple Store people who have seen it also agree. 100% of everybody who sees the two iPhones side-by-side agree the iPhone 6 Plus is the one that is brighter. So I will think about exactly how much this bothers me for a bit. I’ll see what my carrier offers. Perhaps an iPhone 6S Plus if I decide to stick with Apple. Or maybe it’s time to look into Android substitutes. Since Apple is offering a complete refund of the full purchase price, I suppose I will tentatively remain an Apple customer for now. But I certainly wouldn’t buy anything else from Apple again unless it was clear there was a full money-back guarantee from the start. I don’t want to go through this experience again. I guess that is the end of my story. I hope other people have better luck than I did with their iPhone 7 Pluses. And I hope Apple reconsiders the way they advertise the iPhone 7 Plus screen. Because what they are advertising just is not what you get. Well, I received the 2nd replacement iPhone 7 Plus today, and unfortunately it is even dimmer than the first 1st replacement iPhone 7 Plus, and both are much dimmer than my iPhone 6 Plus. Here are the results, and thoughts about going forward. Left is 1st replacement iPhone 7 Plus received 12/23/2016, right is 2nd replacement iPhone 2 Plus received 1/23/2017. The 1st replacement is clearly brighter. Switched order to show it’s not a camera illusion. 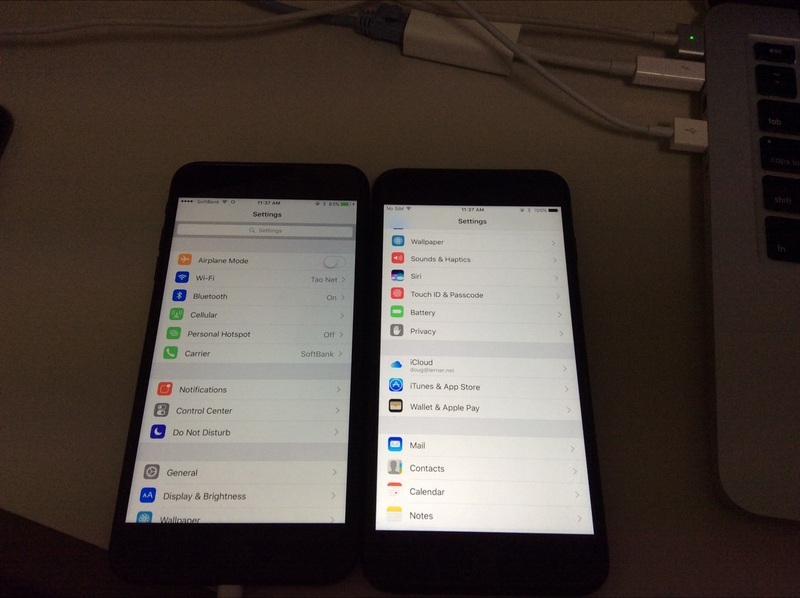 Left is 2nd replacement iPhone 7 Plus received today, right is 1st replacement iPhone 7 Plus. The 1st replacement is obviously much brighter. 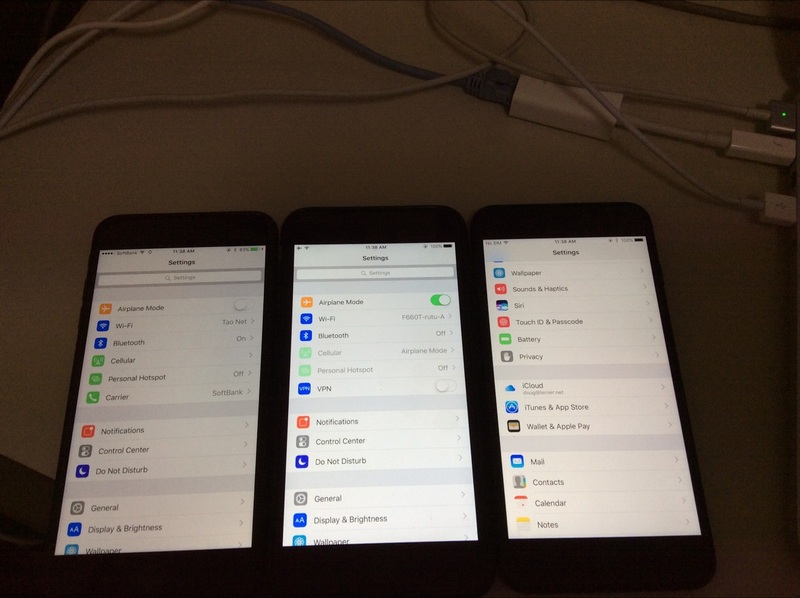 Here we have the 2nd replacement iPhone 7 Plus on the left, the iPhone 6 Plus in the middle and the 1st replacement iPhone 7 Plus on the right. The iPhone 6 Plus is obviously brighter than either iPhone 7 Plus. 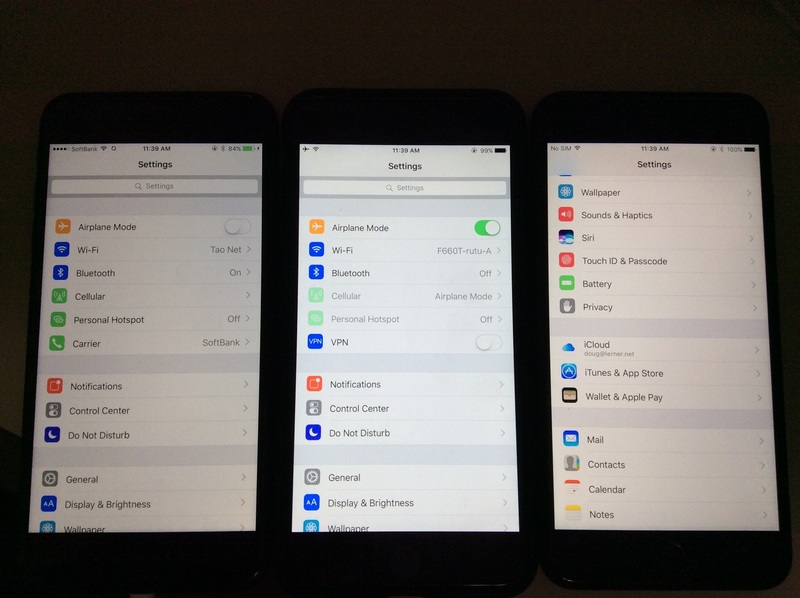 Again, the 2nd replacement iPhone 7 Plus on the left, the iPhone 6 Plus in the middle and the 1st replacement iPhone 7 Plus on the right. This time the view is more straight on. The iPhone 6 Plus is obviously brighter than either iPhone 7 Plus. First, I am going to return the original iPhone 7 Plus and the 2nd replacement iPhone 7 Plus as soon as possible. I’m getting nervous about having all these extra iPhone 7 Pluses here. I have reset both of those devices and packed them up nicely in their boxes, with all the original accessories. Apple can be pick them up at any time. I’m currently using the 1st replacement iPhone 7 Plus, which, while obviously worse than the iPhone 6 Plus is very noticeably better than the 2nd replacement iPhone 7 Plus received today. It’s even more obvious to the naked eye than it is in the photos. 1. There is great variation in the manufacturing of different iPhone 7 Pluses. I know that not just from direct comparison today, but also from seeing my American friends’ iPhone 7 Pluses last month, which I posted photos of. Theirs are clearly much brighter than mine. I am really surprised there is such variation from device to device. As I mentioned before, if something looks darker and looks dingier it is impossible to say it is “noticeably more brilliant and vibrant.” The word “noticeably” means something you can visually see. If you can’t see it, it isn’t noticeable. I don’t know how much Apple wants to continue to try to solve the problem. But there is a problem. I am pretty stressed out from this over the last 10 weeks. One option for me would be to just move on and stick with this iPhone 7 Plus or sell it and switch to another company’s smartphone. In that case Apple will have lost a customer, because how can I ever buy anything from Apple again with any confidence? I would hope that Apple would stand by their word and really try to figure out what is going on here. I wonder what I should tell my friends and colleagues at this point. And I’ve still been waiting more than 2 months now to send my iPhone 6 Plus to my sister. Anyway, that’s how things stand now. I will post again if and when I have updates.